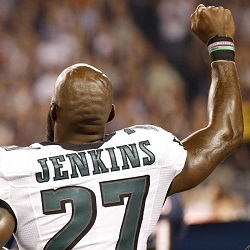 Malcolm Jenkins is apparently too good to get blackballed. The two-time Pro Bowler and All-Pro safety for the Philadelphia Eagles was right there on the front lines with Colin Kaepernick and Eric Reid in 2016 when those two former San Francisco 49er teammates began kneeling during the pre-game playing of the national anthem, a move that sparked a movement of NFL players publicly protesting police brutality and racism in the United States. Jenkins, who is widely recognized as the heart and soul of the Eagles, chose to protest by raising his fist during the anthem — similar to track and field icons John Carlos and Tommie Smith at the 1968 Olympics. His version of silent, yet powerful protest drew its share of headlines and support and criticism.